When Racepak introduced their series of V-Net data loggers, which allows all sensors to transmit their data back to the data logger via a single cable, the next logical progression in this technology was to add the ability to plug gauges and dashes into this same V-Net cable. By doing so, this would allow the gauge to share the sensor information with the data logger, thus providing a true �vehicle network� of data logger, sensors and gauges, all routing their data through a single cable. This design has proven to be tremendously popular, as the installation, weight and complexity of data systems and related components was greatly simplified. Taking this design a step further, this line of �Intelli-Gauges� and LCD Digital Display Dashes could now use the data transmitted down this single V-Net cable to activate external warning and shift lights, while being programmed through this same single V-Net cable. Now, all programming, warnings, data logging and data display would be accomplished in a very efficient manner. There are three models of the UDX dashes available. 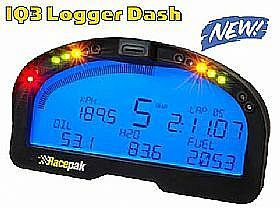 The �Street Dash� and the �Replay Dash� are stand-alone systems. They do not require a data recorder. A third version, the �Display Only� dash, is only used to display data that is being monitored by one of our V-series data recorders. The Street Dash has all the amenities needed on a street-driven vehicle. Through a combination of your existing sensors and those included in the kit, this dash will provide you with the ability to display engine RPM, speedometer, odometer, water and oil temperature, oil pressure, battery voltage, and fuel level. It has internal indicator lights for such items as low oil pressure, high water temperature, turn signals, high beam, and parking brake. Additional functions can be displayed with the purchase of the appropriate V-Net sensor and module combination. A relay for an electric fan controller, and a minimum/maximum recall function, are included in the Street Dash kit. The Replay Dash is another stand-alone instrument. In addition to providing real time display this dash can store up to 10 minutes of memory for replay on the dash. The Replay Dash kit includes a wire loom and sensors for engine RPM, water temperature, oil pressure, and battery voltage. Sensors for monitoring other function must be purchased as options. Unlike the first two versions, the Display Only dash is designed to be used as an add on instrument for V-series recorders. It will display any function that is being monitored by the recorder to which it is attached.